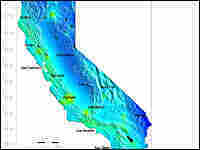 Hourly Earthquake Forecasts Available for California Scientists are unveiling an hourly earthquake forecast for California. The good news is that it's more likely to rain on any given day. Scientists are unveiling an hourly earthquake forecast for California. The good news is that it's more likely to rain on any given day. Preparing for the next potential disaster may be getting a little easier for Californians. Just as residents can turn to the Web for the latest weather forecast, they can now consult a new government Web site that forecasts any significant earthquakes in the next 24 hours. The good news is it's much more likely to rain than shake in the Golden State, but that's not really the point of the new Web site. NPR's Richard Harris explains. Californians know that a damaging earthquake can happen any day now, but it probably won't happen tomorrow. Now people who want a more precise way to view that risk can click onto a new Web site developed by Matt Gerstenberger at the US Geological Survey. Mr. MATT GERSTENBERGER (US Geological Survey): The most prominent thing that you see is a map of California that's got a lovely color scale on it, so it goes from deep blues to some reds that shows some probabilities of what you can expect the ground to shake. HARRIS: Most of California trends toward the blue, and, no, that's not a political forecast. Blue means the risk of a quake tomorrow is less than one in 100,000, so most people won't dash to their computers each morning to check the forecast for the next 24 hours. Still, Gerstenberger says the map could be useful right after a significant earthquake. Mr. GERSTENBERGER: It's really focused on providing this information during aftershock sequences because during aftershock sequence, we have a better understanding, a better grasp of t what's going on, so we can give much better ideas of what's to be expected in those cases. HARRIS: What is to be expected after a large earthquake are aftershocks. Some of them could be damaging. Take, for example, the strong earthquake in Parkfield last September. The day before the quake, the forecast for the Central California hamlet was bluish green, indicating a risk of less than one in a thousand. Oops, that one turned out to be wrong. But shortly after the quake, the computer program that generates the hazard map quickly bumped up the risk of damaging aftershocks with Parkfield at the bull's eye. Mr. GERSTENBERGER: At the very center of that bull's eye, right close to the main shock, there's a very high probability--we get into the red zone on the maps--a very high probability of this amount of shaking in the next 24 hours. HARRIS: And that map was right. There were two big aftershocks in Parkfield on the next two days. Strictly speaking, the quake forecast is much better than the weather bureau can manage. It's correct more than 99.9 percent of the time because it almost always says there probably won't be a big quake today. HARRIS: Duncan Agnew is at the Scripps Institution of Oceanography. HARRIS: The Web site is intended primarily for public education, but Gerstenberger says he also learned something of scientific interest in the course of developing it. Mr. GERSTENBERGER: One of the most surprising things, I guess, was how long in years increased hazard from an aftershock sequence can last. HARRIS: Take, for example, the huge Loma Prieta quake in the San Francisco Bay area. That hit in 1989. Mr. GERSTENBERGER: And if you know where to look on the map, you can actually still see an increase in probabilities. It's quite low at this point in time, but if you know it's there, you can see it. HARRIS: You can look for yourself on the Web. You can also read the technical details in the latest issue of Nature. Richard Harris, NPR News. NORRIS: If you're interested in the earthquake forecast site, you can see it at our Web site, npr.org.